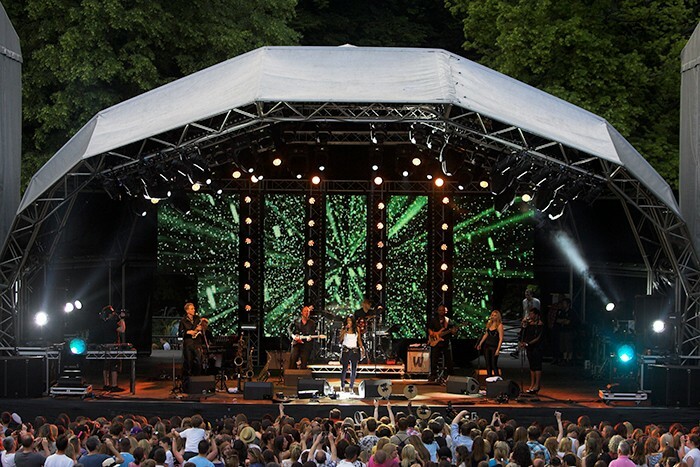 The first music festival to be promoted by an industry technical production company - Chilfest by Universal Event Productions (UEP) - was a resounding success at the weekend. 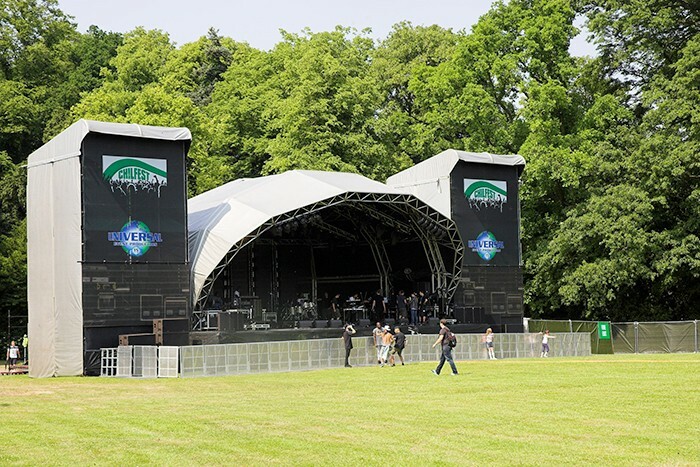 Glorious weather, a sizzling line-up and a fantastic atmosphere helped attract up to 5000 people the first day and sell out Pendley Meadow in Tring, Hertfordshire, UK to its 7000 capacity on the second night. Music fans in and around the area enjoyed two days of great entertainment. The pop themed Friday night was headlined by Little Mix, The Lovable Rogues, Heather Small and others, followed by the best of the eighties on the Saturday: Tony Hadley, Rick Astley, Howard Jones, Midge Ure, Hazel O’Connor and Carol Decker. All of this was delivered complete with the very highest in production values by UEP who supplied sound, lighting and video equipment and design. UEP's Steve Butcher who came up with the ambitious idea to celebrate the Tring based company's 15th birthday was "Completely blown away" with the response and the outcome. "We set out to do something special to celebrate an important company landmark and simultaneously bring something back to the local community,” stated an extremely happy - but exhausted - Steve at the end of the event, which really seems to have hit a chord! In addition to overseeing an exceptionally busy workload for UEP whose main business is concentrated in the high-end corporate and live events sector, Chilfest has consumed copious amounts of his energy in the last six months. Working in the production industry, Butcher and his team not only had their own scrupulously high standards to meet, the pressure was on to ensure that all the technical and stage management elements ran like clockwork. 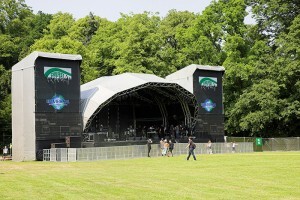 The low rise 15 metre wide Orbit stage supplied by Trust Events tucked neatly into the corner of the Pendley Meadow site inconspicuously hugging the tree line. UEP supplied all lighting equipment and visuals: LED screen and cameras, and asked HPSS from Hull on board to look after the PA system. Ben Cash and Dave Amos of Flare Lighting, a London based visual design duo, were commissioned by Butcher to create an overall production design based on being flexible and dynamic to cover the range of acts playing, and also being able to accommodate any last minute requests. They sub hung two trusses from the Orbit which were shaped to the roof to maximise all the available height and ensure it looked super-neat, with a further upstage truss used to fly five columns of UEP's Glux 12 LED screen. Cash ran lighting using a moving light rig primarily comprising Robe products including 12 brand new Robe ROBIN Pointe fixtures just bought by UEP, which arrived just in time for the show. Robe ROBIN LEDBeam 100s were arranged in columns at the back between the strips of LED screen, looking highly effective, together with Robe LEDWash 600s and 300s dotted all over the stage together with a few ColorSpot 1200E ATs. In addition to these, six Clay Paky Shot Lights were used on the floor as fillers down both sides of the stage, 24 Showtech Sunstrips framed the LED columns and outlined the front truss, two Novalight High Grounds were placed at the downstage edges for big bold effects, and a couple of six lamp PAR bars were used for basic stage washes on the front truss. Four Robert Juliat Korrigan followspots were stationed at FOH. Flare lighting provided the control package. A grandMA full size ran the lighting and a grandMA light triggered their Catalyst media server storing all the video content, which was compiled for the show by Dave Amos and appeared on the on-stage screens creating a vibrant backdrop for all the acts, most of which took the stage in daylight. Two Glux 12 side screens were supplied by UEP together with six cameras: five Sonys and a GoPro remote behind the drum position for reverse shots. These were directed by another regular UEP face, Mike Kane, who worked with Jay Martinez on the IMAG side of the video. 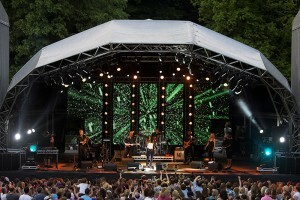 The sound system was designed and specified by a combination of stage manager Andy Nurse, who is one of UEPs regular sound engineers, Steve Bull who looked after FOH for the event and Steve Butcher. It was an L-Aacoustics system which filled the gently racked auditorium perfectly. The main hangs were 12 boxes of dv-DOSC a side compete with seven SB28 and four dv subs a side with four ARCS for in-fills. The FOH Yamaha PM5D console was specified by Saturday's house band, Blueprint, who backed up all the main performers. Some had their own engineers and all the rest were mixed by Steve Bull. Howard Jones brought in a full monitor system and video package. At the stage end of the equation, the monitors were L-Aacoustics Hi-Q wedges with ARCS/SB28 side fills and a couple of SB18 drum subs, all powered by LA8 amps together with the main stacks. The monitor console was a Yamaha M7 with two external cards boosting the outputs to 32 channels. Both Shure and Sennheiser wireless systems were supplied, plus a full mics-and-stands package, primarily comprising these two brands. Andy Nurse shared stage managing duties with Mike Lindsey, James Fickling was the overall site manager and Charlotte Jackson took care of all the health and safety and dealt with the concessions. Backline was supplied by John Henry’s and the excellent security from EMS impressed many people with their unobtrusive presence that cut a note with the whole Chilfest vibe. Steve adds: “Thanks to Rob Merrilees at Dry High Lighting for providing the six Clay Paky shot lights and some additional Robe LEDWash 600s and big thanks also to my old mate Darren Parker at DPL for supplying 12 Robe ColorSpot 1200E ATs along with the four follow spots, mains and dimming. “We entertained 12,000 people over two nights, it was an unbelievable experience and quite an emotional one for me. My crew are incredible and I am truly humbled by the whole experience,” he concludes with a big smile.